Cavium ARM processors make big server wins, showing Qualcomm isn't going to own this space that easily. Cray has picked Cavium’s ThunderX2 processor for its first ARM-based supercomputer, quite a win for the little guy coming just a week after the 800-pound gorilla that is Qualcomm formally introduced its ARM-based server processor, the Centriq. 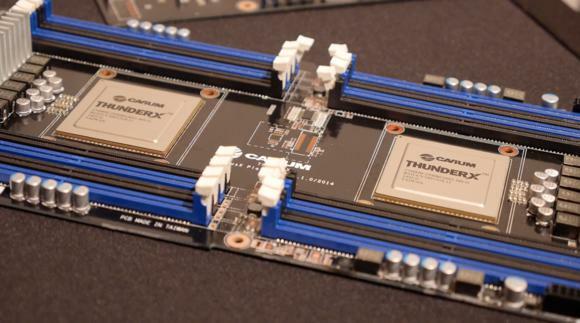 The Cavium ThunderX2 processor is based on 64-bit Armv8-A architecture and will be used in the Cray XC50 supercomputer. Cray customers will have a complete ARM-based supercomputer with all of the company’s software tools, including the Cray Linux Environment, the Cray Programming Environment, and Arm-optimized compilers, libraries, and tools for running today’s supercomputing workloads. “Adding ARM processors complements our system’s ability to support a variety of host processors, and [it] gives customers a unique, leadership-class supercomputer for compute, simulation, big data analytics, and deep learning,” said Fred Kohout, Cray’s senior vice president of products and chief marketing officer, in a statement. Cray is working with multiple supercomputing centers on the development of ARM-based supercomputers, including labs in the U.S. Department of Energy and the GW4 alliance, a coalition of four leading, research-intensive universities in the U.K.
Cray XC50 supercomputers with the Cavium ThunderX2 processors will be available in both liquid-cooled cabinets and air-cooled cabinets to address a variety of data center needs. Liquid cooling is growing in popularity but still modest in use. Its primary advantage over air cooling is it can handle much more compute density than air cooling, which is limited in how much it can cool. The drawback to liquid cooling is it carries a price premium over air cooling. The XC50 can mix and match compute blades with Intel Xeon Scalable processors, Intel Xeon Phi processors, and Nvidia Tesla GPU accelerators. The ARM-powered Cray XC50 will be available in the second quarter of 2018. Overall it’s been a great week for Cavium. Ingrasys, a fully owned subsidiary of the giant Foxconn Technology Group of China, announced the production sampling of their rack-mount server platforms based on Cavium ThunderX2 products. The Osmium platform from Ingrasys is a 2U4N rack-mount, density-optimized server platform, optimized for cloud and high-performance computing (HPC) workloads. It has four compute nodes in a 2U form factor, with each compute node holding two ThunderX2 SoCs in a cache-coherent, dual-socket configuration with up to 1 TB of memory per node and 4 x16 PCIe slots, ideal for GPUs. Another giant Chinese ODM, Gigabyte Technology, also announced production availability of ARM-based server platforms based on ThunderX2. Gigabyte's R181 series is a 1U platform with dual-socket ThunderX2 compute node with best-in-class throughput, memory configuration and capacity. The chassis has multiple PCIe expansion slots and support for up to 24 SSDs. It’s a very good showing for Cavium and not entirely surprising. Comparing Qualcomm and Cavium in ARM to Intel and AMD in x86 is tempting, but not at all fair. AMD allowed its competitive edge to slip and has only recently gotten its mojo back. Cavium has been making custom SoCs for years based on the MIPS architecture. It has migrated what it learned to ARM and was first to market, and giants like Cray and Foxconn recognize that. So, it’s a good thing Qualcomm won’t just mow them over as everyone jumps on board with the big player.